The phrase "jumbo jet" has been in use for decades but takes on new meaning in Dec-2015 with the planned entry into service of Emirates' two class A380 seating 615 passengers – the most yet of any aircraft. The version will have 18% more seats than Emirates' largest A380 and will be the first time an A380 does not have first class. Emirates is removing that cabin (with its onboard showers) as well as some business class seats to make room for more economy seats. The aircraft is initially to be deployed to Copenhagen and Bangkok, destinations with high leisure but limited premium demand. Emirates plans to take an initial 15 of these aircraft. Already its 73 A380s on order account for 64% of the type's backlog. 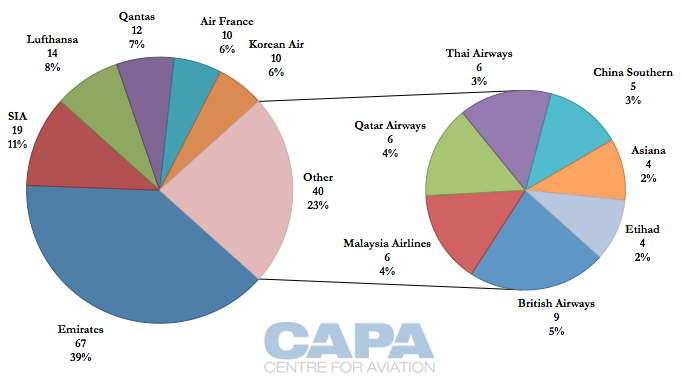 Half of the in-service fleet is held by Emirates and Singapore Airlines. As the first operator and with shorter leases, SIA is planning the future for its first batch of A380s. SIA does not intend to renew the leases of these aircraft since they are some of the first and do not incorporate later production chain efficiencies. Emirates in Dec-2015 is due to place into service its latest A380 configuration, a two class version seating 615. This has 18% more seats than its most dense A380 configuration (519 seats). Emirates’ new 615 seat configuration is also 14% more dense than the largest A380 configuration in active service, that from Air France (538 seats). However, this version from Air France is being retrofitted to include premium economy, which will reduce the seat count to 516. The next largest configuration is from Lufthansa at 526 seats. This version is also being retrofitted to include premium economy, which will reduce seat count. Once the retrofits are complete, Emirates will have the two largest configurations (seating 615 and 519). Emirates and Qatar will both operate A380 with 517 seats, the third most dense configuration. The fourth most dense version will be from Air France (516 seats) followed by Lufthansa (509), Thai Airways (507) and China Southern (506). All other operators/versions will have under 500 seats, mostly above 469 seats. The exceptions are Singapore Airlines with a 409 seat version (second least dense) and Korean Air with 407 seats, the least dense. Emirates' 615 seat configuration retains an all economy lower deck as seen on all of Emirates’ other A380s. The 615 seat configuration removes all 14 first class seats (and their two showers) – the first time an A380 will operate without first class. Business class is also reduced from 76 on its other configurations to 58. Economy seats replace the first class cabin and part of the forward business section. Without a first class cabin, Emirates' 615 seat A380s will reportedly not have a strengthened upper deck floor that was needed to support the weight of first class seats. This means it would be exceptionally difficult and costly to retrofit in a first class section at a later date, should there be any change of strategy. Emirates has said it will take 15 of these two class aircraft. Their deployment opportunities may be niche given high density (putting extra requirements on airports), low premium seats and limited range. Initial markets are, so far announced, to Bangkok, Copenhagen and Kuala Lumpur. Although schedules were filed to deploy the two class variant to London Gatwick, this was reversed (likely because of the need for more premium seats). Copenhagen was selected for a variety of reasons: it has a limited premium market but large leisure segment, and the airport was proactive in making modifications to accommodate the large configuration. Emirates will be able to broadly maintain market share with a single daily flight compared to Qatar Airways, which is growing through frequencies. Etihad does not operate to Copenhagen. Gulf-Copenhagen dynamics were covered in a recent report on the Danish airport. 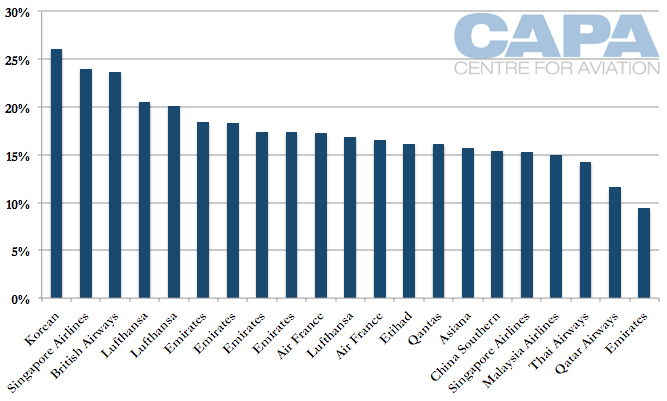 See related report: Copenhagen Airport's Gulf and Asian growth: 615-seat Emirates A380, soon Cathay? In Bangkok, Emirates is likewise not further growing frequencies. It operated approximately four daily flights in Dec-2011 and Dec-2012, increasing to six for Dec-2013, Dec-2014 and Dec-2015. 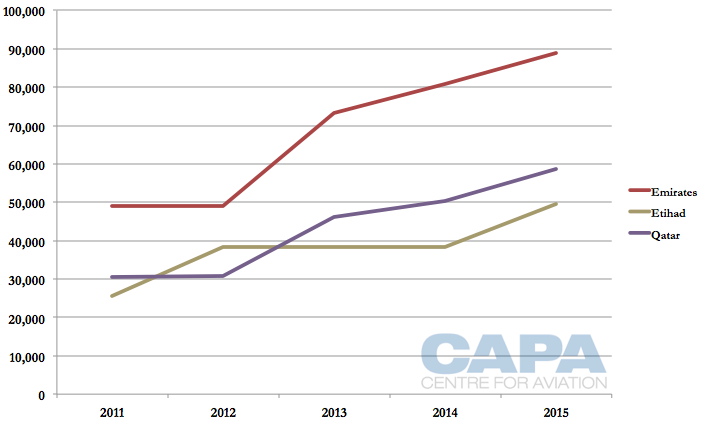 Emirates' Dec-2015 seat capacity to Bangkok will be 10% higher than in Dec-2014. This is due to one frequency shifting from 777-300ER to two class A380. In Dec-2014, Emirates operated three daily 777-300ER and three daily A380 flights. In Dec-2015 this will be two 777-300ER flights and four A380 flights. 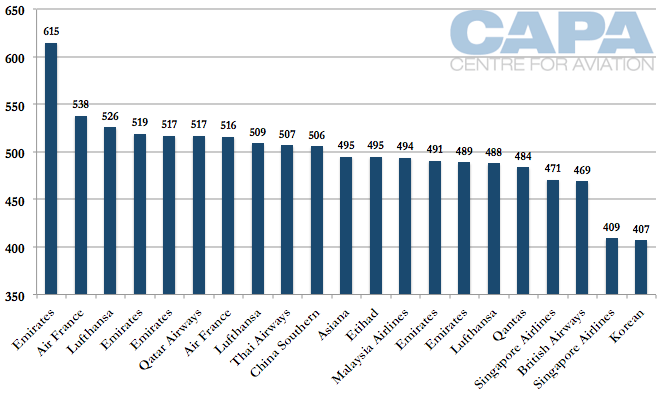 Between 2011 and 2014, Emirates has been about 60% bigger in Bangkok compared to Qatar Airways' seat capacity. But in Dec-2015 Emirates will be 52% larger owing to faster growth at Qatar. When the A380 was introduced, the first reaction was to promote it as an ultra-luxe operation. Passengers loved it and the aircraft would typically command a yield premium over other aircraft. But time moves along and Dreamliners and others take on the new role. The A380 is still a special aircraft and some are equipped with showers (ask Jennifer Aniston) or even with a full scale apartment (ask Nicole Kidman), but its size means it can be a ferociously low cost operation if packed with economy seats. Hence Emirates' new two class A380s will have the fewest premium (first/business) seats of any A380 configuration: 58, all in business as the configuration does away with first class. The next smallest premium seat offering is from Qatar with 60 seats. Singapore Airlines and Thai Airways each have 72 premium seats, the next lowest offering, but SIA has a second configuration with 98 premiums seats, one of the highest. The largest number of premium seats are offered by Korean and Lufthansa with 106, overtaken by British Airways with 111. But these high configurations do not offer direct aisle access in business class. Emirates' two class A380 also means the share of premium seats drops to 9%, the first time an A380 configuration has less than 10% of its seats in premium cabins. The next lowest proportion is held by Qatar with 12%, followed by Thai with 14%. 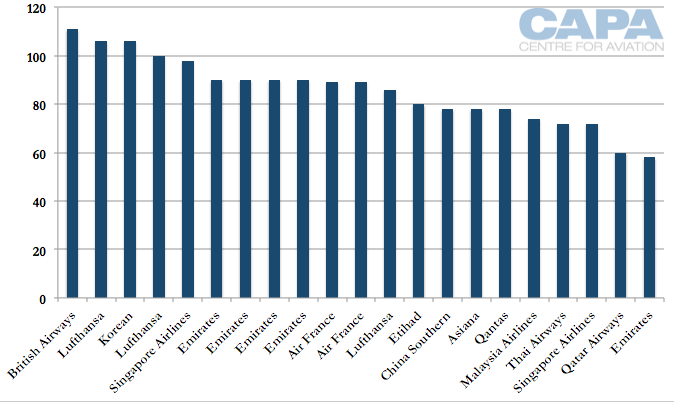 British Airways and one of Singapore Airlines' configurations have 24% of seats in premium cabins while the highest share is held by Korean Air with 26%. 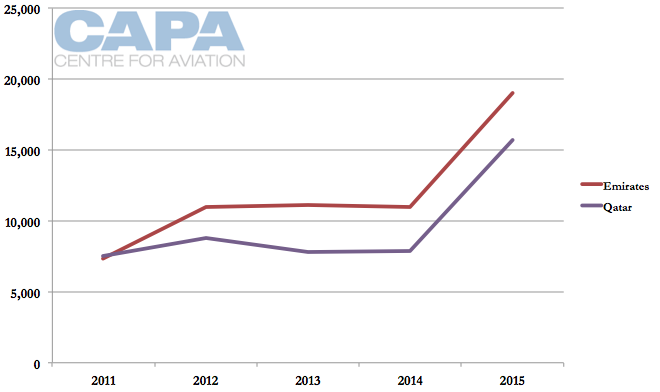 The CAPA Fleet Database tracks the 172 in-service A380s and 115 on order. Emirates and SIA account for half of the in-service A380 fleet, with Emirates' 67 aircraft representing 39% of the fleet and SIA's 19 being a further 11%. 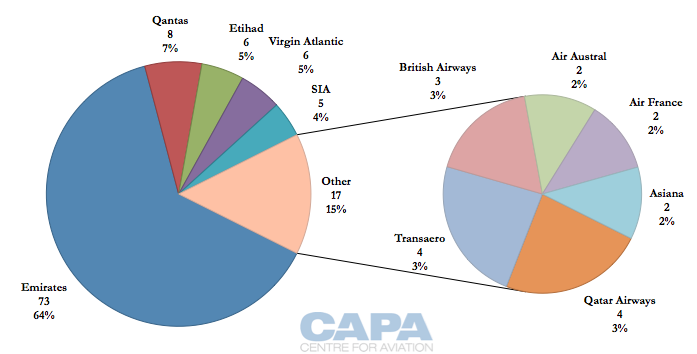 About a quarter of the in-service fleet is held by seven carriers (in total, 13 airlines operate the A380). Those seven carriers each have no more than six aircraft delivered. Eight existing operators still have A380s on order. Their orders collectively account for 90% of the type's backlog, but it is unclear exactly how many of these orders will be fulfilled. Five airlines have received all of their A380s on order and do not have any outstanding deliveries (these five airlines are China Southern, Korean Air, Lufthansa, Malaysia Airlines and Thai Airways). Discussion around the A380's future has focused for some time on the prospect of an "A380neo" and how long the type's production can be sustained given a limited backlog - and one that rests heavily on one operator, Emirates. Increasingly the topic of discussion is the fate of A380s coming off lease. Singapore Airlines has a batch of A380s with 10 year leases expiring in 2017. SIA in 2012 placed a follow-up order for five A380s, which are due to be delivered in 2017 and 2018. SIA intends for them to replace the A380s coming off lease rather than to be for growth. These SIA A380s were some of the first off the production line and, as would be expected for early models, do not have the efficiency and programme lessons learned from aircraft delivered later. SIA does not believe even handsome lease discounts makes this A380 cohort viable to operate. Some believe it is most likely the five A380s coming being returned by SIA will be scrapped. Those looking for second-hand A380s have more viable options. There has been industry debate as to whether the leases would be renewed. The theoretical argument was that it could have been cheaper for a lessor to give SIA an exceptional deal on renewing its A380 leases rather than placing the A380s with another customer. A discount would need to be weighed with the cost of updating the product on these A380s, which are becoming aged, and if there were suitable markets for the type to fly on. Liberalisation – to China, India and fifth freedoms to access North America – have not occurred as fast as hoped. But again, SIA does not believe this batch of A380s will be viable to continue operating. The second-hand A380 market is uncertain given the large size of the A380 and its heavy level of customisation. Standard configured aircraft can fit easily into another airline's fleet, customised ones not so. Second-hand operators would have to be content with the type's basic configuration and willing to take on some retrofit work (SIA would not allow its custom seats to be used by others). More extensive retrofits could be prohibitively costly. It was recently enough of a challenge to replace Skymark Airlines' all premium economy A330s, a newer and smaller aircraft than the A380. Emirates plans to replace its oldest A380s with new order A380s; it does not plan to operate 140 A380s at the same time - or any sum near that (comprised of its 67 in-service A380s and 73 on order as of Oct-2015). Although Emirates expects its aircraft, well utilised, will be scrapped rather than re-allocated, for its leased fleet that will be a decision for lessors. Whereas SIA has 10 year leases on its initial A380s, Emirates has 12 year leases, which mean its A380s only start to come off lease in 2020. Based on current fleet orders, it is unlikely that there will be a new A380 operator. Virgin Atlantic's order has long been in doubt (and 49% partner Delta has expressed its A380 opinion loudly through its CEO), Air Austral does not plan to take its A380s on order, Skymark's order was cancelled in summer 2015 and Transaero's order was in doubt before the airline collapsed (it had postponed the order in Aug-2015). All other A380 orders are with existing operators. In addition to aircraft coming off lease, some operators are exploring early retirement of their A380s. There are also assembled A380s for Skymark that now have no customer. There is consequently a potential for significant numbers becoming available. By shifting the centre of gravity of the A380 profile with its 600+ seating, Emirates may be attracting the attention of some would-be operators for whom premium services hold no attraction. The unit seat cost becomes increasingly attractive for a low frills operation. But, for an aircraft that Airbus says is a mega-hub link aircraft, there are only so many mega-hubs (by 2020 there will be over 60 of them worldwide); moreover, a 600+ seater is, for practical reasons, more limited in range than the earlier premium-configured aircraft, further restricting the variety of viable routes. This suggests that if there are to be viable markets, these may well be in Asia, where much of the innovation is occurring. There growth is high, price sensitivity is high, congestion is rife and slots in short supply - and four to eight hour stage lengths can attract a variety of city pairs. Where the price is right, new buyers may emerge. That said, for the time being, this is not the likeliest option.